Last year, the number of spinning reels that made it to your favorite tackle shop must be overwhelming. 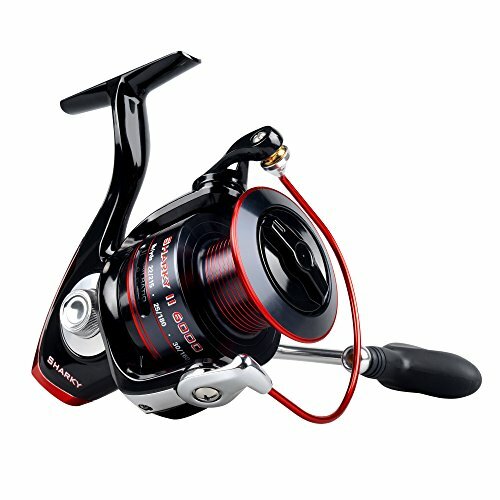 You will need the objective comparison to get the best spinning reels in the market today. After all, great equipment, together with knowledge and skills, is one of your arsenals to have an enjoyable fishing experience. Since its introduction in 1948, this gear has become known as an ideal fishing tool. It is composed of four parts. One is the housing or the outer case, the other part, called spool, holds the line, the metal bail locks the line on the spool, and the handle used to retrieve the line. S? ?pinning ree? ?l has become a favorite equipment for anglers because the basics of using it are very easy to learn. It also works quite well with different kinds of tackle, baits, and lures. At the same time, it is convenient as it can be used to catch different fish species or in varied water conditions.With these advantages and factors in mind, here are things that you should think about when buying your own reel. One of the most obvious but usually taken for granted factors in choosing a reel is the water. Salt water has a corroding effect on surfaces particularly metals. Also, salt water is home to some of the largest fish on the planet. As the ocean is vast, it is also home to a different environment – thermal vents and coral reefs as the most common examples. What this means is that brackish and salty water each has a unique effect on fishing and that it changes the fishing methods and equipment. In other words, you have to take into consideration the water factor that comes in choosing the right reel for your purpose. If for example, you will be using it mostly on saltwater, you need to choose a reel that can withstand corrosion as well as powerful fish. It must operate with precision and remain durable for years to come. The best trout reel may be different with the reel you would use for freshwater bass fishing. At the same time, different targeted species may be bigger in certain parts of the world. For example, in Western America, major rivers are known to be home large trout that can test rod and reel made for light to medium combos. On the other hand, catching bass, for example, has a different challenge as well as it requires high-speed retrieve. It also needs a quick anti-reverse to match the movement of your target. In this case, you will need a reel that has a smooth operation with ten ball bearings as well as a roller bearing for instant anti-reverse. What you need is a reel that is tough enough to handle strong shocks and heavy loads especially if you are heading for saltwater or freshwater fish that weighs more than a hundred pounds. It must also withstand the instantaneous shocks that come when a large fish strikes on a bait. On the other hand, for average to smaller fish sizes, the reels should also be from lower weight ranges. In other words, you will want an equipment with high-quality construction values including having strong materials, resistance to corrosion, precise engineering, high standard components, and quality internal seals. You will want this information when comparing spinning reels to buy. It is a vital information that manufacturers make it a point to print it on the side of each reel they produce. The gear ratio refers to the number of times a bail can spin on one rotation of the handle. The average slow ratio is 4:1, the medium is 5:1, and fast is 6:1. This is important in fishing as it determines the speed of the retrieval, especially when fishing with lures. This means the higher the ratio, the faster you retrieve your line back to the spool. Thus, you get your lure back faster with a 6:1 compared to a 4:1 with the same effort.Also, the higher ratio is a must for lures that require faster speed through the water. Lower speed ratio limits the functionality of your rod and reel combo. It is important to keep in mind that higher ratio reels adjust better downward compared to speeding up a low ratio retrieving reel. Not to mention it can be tiresome for anglers to try and put more action to slower ratio reel. This built-in solution to lines snapping due to powerful fish pulls is called a drag. This is a system found in the housing that releases more line in case of strong pressure. This release allows the fish to remain hooked while the line remains intact.When choosing a reel, consider that there are two types of drag. One is the front drag design, while the other is on the rear. This is its main difference and you will want to check your preference when choosing the location of the drag. The front ones have large washers which make them more durable and sustainable with better performance compared to rear drag systems. On the contrary, the rear ones are so much easier to adjust although they are not as strong or as durable as the front systems. This refers to the length or amount of line that the reel can accommodate. As far as line capacity is concerned, factors such as the thickness or weight of the line and the size of the spool have to be considered. This information is usually printed on the housing of the reel. This factor encompasses the weight and the size of the reel and how easy it is to use. The fact that you enjoy fishing does not erase the challenges of it. Sometimes you have to cast a hundred times or more before you can even have a bite. For sure, you will want equipment that will not make it harder for you. With the factors given, here is a list of the five best spinning reels in the market this year. This list is in no particular order since the “best” one depends on your needs and specifications. This powerful design from Shimano is recommended for kayak anglers who like a classic look but tougher than the older models. It stands out with its mostly white finish. Despite its delicate look, it is constructed with only a few plastic parts and mostly high-quality materials such as solid aluminum and lightweight graphite. 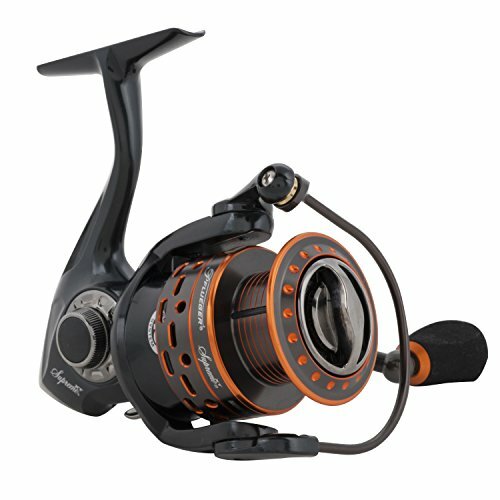 Despite being not moderately priced, this reel has received much positive feedback that it may be worth the investment. While it is an all-around fishing reel, this model is best suited for small to medium saltwater fish. It is a hybrid of composite and metal materials, which makes it strong and lightweight at the same time. Despite being moderately priced, it has features that are also found in other high-end models. This high performing model has received a lot of positive reviews due to its high-quality materials. This includes magnesium that helps keep it ultra light and balanced, and carbon composite that keeps it strong and light at the same time. Anglers who have used it attest to its superb feel, smooth casting ability, and reliable durability with its sealed carbon fiber drag. Most importantly, it has been reported to last for years. Well, that is with proper care of course. 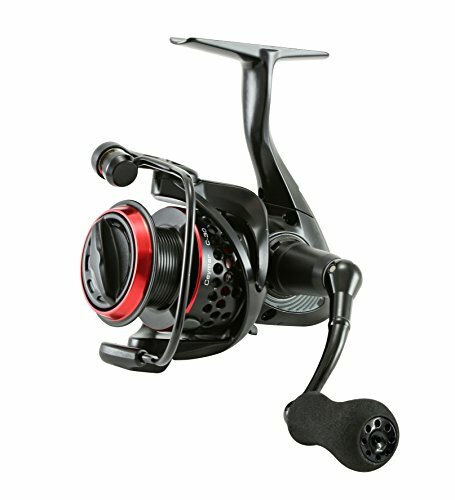 FIERCE NEW DESIGN-A fantastic must have spinning reel with new and improved body, rotor, spool and gears that is lighter and stronger for spectacular casting, less fatigue, and durability. KastKing Sharky II spinning reels offer the best value with more features for the most bang for your fishing buck! 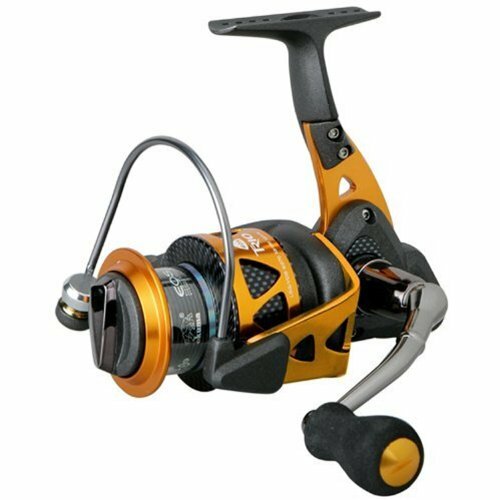 BUTTER SMOOTH 10 + 1 corrosion resistant MaxiDur bearings, increased strength precision mesh brass gears, and stainless-steel shaft adds to this fishing reels super slick retrieve and toughness when battling big fish. POWERFUL- Use the Sharky II spinning reel with up to 48.5 lbs of triple disc carbon fiber max drag capability to conquer monster fish! New designed CNC aluminum spool with better line-lay and more line capacity features lube retention grooves for longer life and smooth, fluid yet powerful operation. A true bulldog of a fishing reel. VERSATILE: Perfect for freshwater bass fishing, trout, perch, salmon, pike, catfishing and even saltwater surf fishing (Recommended only on 6000 size and above). AFFORDABLE INNOVATION: Amazing water intrusion resistance system, sealed rubber o-ring spool, shielded one-way clutch, creative body lube retention grooves, helps prevent water and dirt from getting into your fishing reel. Fish all day and all night without worry. Backed up by a one-year warranty. The latest spectacular product from Sharky II is the lightest and strongest model the brand has by far. Check out its carbon fiber drag power plus more line capacity and ball bearings. It helps that it’s easy on the pocket as well. The C-30 is best for intermediate size fish like catfish, bass, carp, walleye, and steelhead to name a few. It has garnered stellar reviews from anglers for its high speed spinning capacity, comfortable handle, and reduced size. Multi-disc drag system, which works really well on different levels of pressure. Light-weight but comes with a drilled spool and thick bail wire. Sleek black design that looks good with almost any type of rod. Comes with aluminum spool, which makes it a good base for braided and monofilament lines. Forged aluminum handle that allows complete control and comfort. The reel is slightly oval and not entirely the traditional circular pattern. This may be an issue to some anglers who find the shape rather distracting. Some reviewers worry that this modestly priced reel cannot take too much pounding for a long time. Potentially not the best model for hard fishing. 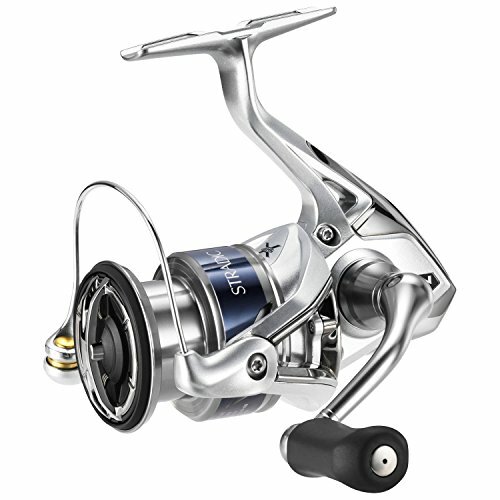 Of the products mentioned above, Shimano Stradic HG takes home the prize based on the factors to consider in buying a reel. For one, it is corrosion-proof, which means it works well in brackish or salty water. In terms of construction, it is definitely tough enough to handle harsh conditions and shocks. With gear ratio, Okuma Trio and Pflueger Supreme XT are both faster, but Stradic FJ can stand its own with 6:1. It also has waterproof 15+ lbs drag, so that’s another tick in the box. Although it is the most expensive of the five products mentioned, Shimano Stradi FJ Spinning Reel has proven to be a worthy investment for anglers of different levels of expertise.